Ora was born under the sign of Sagittarius, December 2006. Function and aesthetic have been married within this brand ever since. 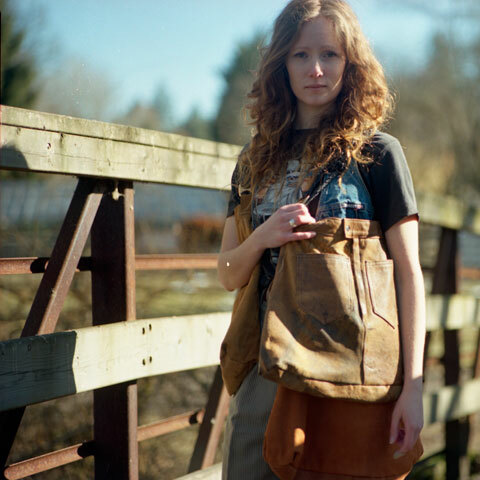 Randi Obenauer loves to celebrate the true beauty of leather through minimal, classic designs that are functional and durable. Made by hand with skill and care to ensure that every Ora object is built to last you a lifetime of companionship. The Ora classic styles carry over season to season, alongside capsule collections and batches of one of a kind creations. Randi uses high quality leather hides, ranging in finish and hand, from supple pebbly black upholstery weight hides, to specialized oil-tanned heavey weight hides. All hardware and trim are industrial quality. Randi’s diverse educational background includes a Diploma in Fine Arts, an Advanced Textile Arts Certificate, trade certification in Automotive Upholstery and Industrial Sewing, and she graduated from Helen Lefeaux School of Fashion Design in 2007.
how do I care for my ORA product? my personal philosophy with leather is to wear it, use it, enjoy it, and embrace the changes that that come with age! Leather is tough, durable, and part of its beauty is the way that it ages. If you would prefer to ‘protect’ your leather bag, visit your favourite cobbler shop and ask them to request a product that is less harmful to the environment, and to your skin. repairs? did you do some damage to your beloved bag? it happens! I can help with repairs for a nominal fee, email me some photos and we can figure out a solution. Otherwise, take it to your favourite cobbler shop and see if they can help! returns? if you weren’t quite ready to invest in your dream bag, and you really need a refund, I will honour refunds within 24 hours of purchase, minus the fees I will lose to paypal, thank you for understanding. Otherwise, once I ship the product, all sales are final – again, thank you for understanding, as I personally hand make each bag as it is ordered. custom? I LOVE custom orders! Do you want a classic Sadie bag with extra long tassels AND a quilted bottom AND a patch inside with your initials…just email me! I can quote you for extra details. And I LOVE doing custom one-off designs, send me your ideas and I will do a sketch for you of my interpretation from my artistic perspective. shipping: is FREE on all bags, within Canada and USA!